The BMW 635CSi first made its appearance back in 1976. It was the beginning of the 6-Series of BMW. The car was quite popular and sold over 86 000 units in its 13 year production life. The first 6-Series is a stunning looking car and this makes it very popular in the diecast world. Luckily there are several good models of it in all of the popular scales. In this case we will take a look at the 1:43 model made by AUTOart. But before that we will get closer with the real car. It had a 3.5-liter petrol engine developing 215 hp. You could fit your car with either a 3- or 4-speed automatic gearbox or a 4- or 5-speed manual gearbox. The car was quite quick as a result. This made it quite popular with all kinds of drivers. Over the years the BMW 635CSi proved to be one of the most popular and favorite versions. It brought the best balance between power and fuel consumption. The car still looks fabulous, especially when it is a good example of it. Happily a good example of it is easy to find in the world of diecast models. In the 1:43rd scale, one of the best choices is the AUTOart model. 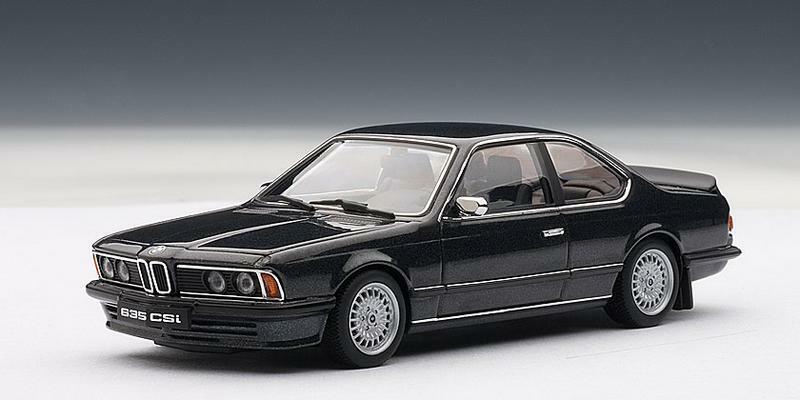 It is finally time to get on with the review of the 1:43 AUTOart BMW 635CSi. The pictures are provided by AUTOart. I want to thank you for your time and for visiting us. Part two is here.